A long take shot of a chubby Denzel waking up in a hotel room next to a naked young lady, nursing a massive hangover with a line of cocaine sets up the trough of despair in which lead character Whip Whitaker has fallen into. Later we see him board a plane as the pilot of a commercial airline jet. What a frightening introduction. In the film’s most celebrated sequence in heavy rain the plane malfunctions and Whip is forced to improvise and land the plane. It’s indeed a bravura sequence, merging fine in-camera effects and CG wizardy. But that’s it for the fancy stuff. The rest of the picture shows the fall out of the experience from the point of Whip’s troubled alcoholic despair. Whip is declared a hero for landing the plane and saving most of the passenger’s lives, but at the cost of putting Whip in the spotlight where his alcoholism threatens to rear its head. Corporate and union lackies Don Cheadle and Bruce Greenwood attempt to clean Whip up for their investigative hearings but are continually stymied by Whip’s inability to stay on the wagon. A relationship between Whip and a reforming heroin addict (Reilly) tests some romantic waters, but admirably Zemeckis stays clear of this familiar kind of tortured soul relationship drama. 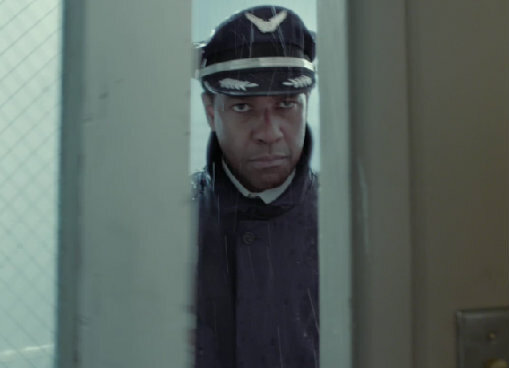 Zemeckis stays lasered in on Denzel and him alone, in what amounts to a remarkable performance, which, if the film were any better would be leading candidate for Oscar. Unfortunately aside from some technical awards Flight will likely stay back behind Lincoln, Zero Dark Thirty, Life of Pi, Django Unchained and other glossier films. This is one reason why Flight is a fine antidote to these other celebrated zeitgeist films, even more of a surprise coming from Robert Zemeckis who has made a career of pushing the technical limits of storytelling. Flight settles into Whip’s story of a closeted alcoholic and the day-by-day battle to stay sober. 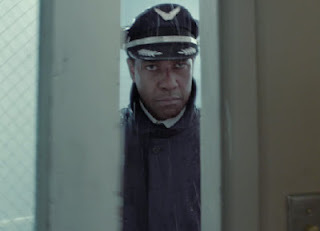 The added complication of a whole nation judging one’s character as the heroic pilot of a crashed airplane creates cinematic internal struggles which a fine actor like Denzel relishes. It’s been a while since we’ve seen something this meaty from him and he delivers. The film falters in only a couple of places. At one point when we discover the plane crash site was a cultish evangelical sactuary, a heavy handed religious parable threatens to take the film in the direction of the pseudo-spiritual Contact. Fortunately this is only teased and Zemeckis nips this theme in the bud. Prominent use of overly-familiar classical rock pop songs doesn’t seem to fit into the mix either. And sadly, the normally reliant character actor Bruce Greenwood is the weak spot as a union rep who tries to shape him up and present Whip as a hero. The finale leads up to a key decision for Whip to make and Zemeckis almost bungles it in a grandiose courtroom-like sequence at the end, but Zemeckis saves the schmaltz and keeps the melodrama in check. If anything there’s a throwback feeling to this film – first the return of Zemeckis to live action, the cinematic style employed by Zemeckis feels very 1990’s, it’s visual formalities, free of any of the camera and lighting trends of today. But what Flight lacks in freshness it makes us for in its meat and potatoes character and conflict.